Risingware Exp+ Free Edition is a complex software program containing a package of the most indispensable applications for any PC user wrapped up in a friendly interface that allows you quick access to a dual-panel file manager, a multi-process browser based on Trident (IE) layout engine, and utilities. Risingware Exp+ Free Edition offers you in no time :Screen Capture Genie, Fast Start Genie, Consecutive File Renamer, File Compression Tool, Image Previewer, File Content Fast Previewer, Multiple Web Search Tool, HTML Component Downloader, Web Page e-Mailer, Web Filter, Internet Download Manager, Boss key, and Windows Shutdown Tool. The Free Edition also includes a 60-day trial of the Professional Edition which has some extra features like a File Backup Tool, a Synchronizer and a Batch Renamer. - Dual panel layout improves multi-tasking, allowing you to easily switch between panes and change window proportion. - Multiple tabs can be opened or moved between windows regardless of their type (folder tabs or web pages). - Manage related folders or web pages by setting them as groups and adding files to a group any time. - Set tabs as auto-locked or auto-refresh web pages with user defined frequency. - Mouse friendly interface. Simply drag & drop folders and links from web pages on the tab bar to open them or use right-click and left-click to open folder, favorite or group to the left or right window. - The floating navigation window offers flexibility and has some useful default tabs such as “Desktop”, “Favorites” and “Backup Files Previewer” (this function allows content preview before restoring it). - Customize your toolbars (Command Bar and Function Key Bar) and benefit from auto-detection of tab types (folder or web page). - Easy searching for files and web sites by just using right-click to switch between “File Search Toolbar" and "Web Search Toolbar". - Multilingual support is available, currently including 8 languages: English, Traditional Chinese, Simplified Chinese, Spanish, French, German, Italian, and Portuguese. - User friendly Start Page divided in three categories: “My Computer”, “Groups” and “Last Unclosed Tabs” each one containing a link list for shortcuts. - Compress and extract in ZIP, RAR or JAR formats with full Unicode and non-English file names support. - Hotkey functions for moving and copying files between windows in no time, supported by the dual-window mode. 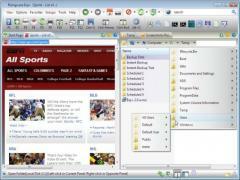 - Floating buttons allow quick access to files, folders or File Content Previewer. - Image Previewer will show a floating auto-sized window just by holding the mouse cursor onto an icon or image file. - Create your personal user-defined search engine list and use all of them simultaneously whenever you perform a search. - E-mail web pages along with a message directly from Risingware Exp+ Free Edition interface with the Web-Page e-Mailer option. - Configure Fast Start Genie by defining hotkeys and aliases for your programs and rapidly start and Windows application. - Quick Shutdown Tool keeps handy important Windows commands including Shutdown, Hibernate, Log off, Restart, and Standby. - Boss Key feature helps you protect your privacy when someone approaches you just by using keystrokes. This software does not actually excel at anything, but it's worth a brief spin.